When my mother was pregnant with my younger brother, we lived in Senegal, West Africa. It was an area where pregnant moms are at high risk of being infected with malaria. According to the Center for Disease Control, malaria is the main cause of death in Senegal, at 9% of all deaths. 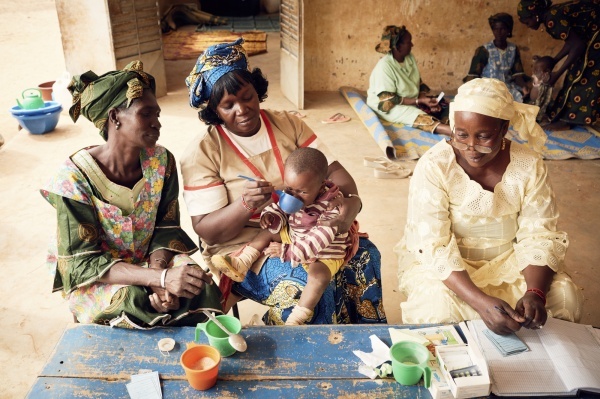 In neighbouring Mali, it accounts for 24% of all deaths. Growing up in Senegal, malaria touched everyone I knew, from our household staff, to the little American girls I babysat. Thankfully, my mother never got malaria, and my little brother was safe from its lethal effects. It was my second sister and I who contracted the illness just a few months after he was born. Thankfully, we were old enough and healthy enough that our bodies, along with swiftly-administered medication, were able to fight it off. But for pregnant moms, fighting off infection is not always so simple, and often has traumatic consequences. Maternal infection is a leading cause of pre-term birth around the world, along with multiple pregnancies, and chronic conditions like diabetes and high blood pressure. That’s why Born on Time, a public-private partnership between the Government of Canada, Johnson and Johnson, Save the Children, Plan International and World Vision, works to help prevent, detect and treat infection for mothers in Bangladesh, Mali and Ethiopia. A child at a Save the Children-supported pre-school is given an anti-malarial medication. Malaria is not the only infection that these mothers must contend with. In Mali, Bangladesh and Ethiopia, infections like HIV, urinary tract infections and respiratory infections also post a serious threat to their unborn children. According to the World Health Organization, prevention and management of infections during pregnancy, and for newborns, is key to preventing preterm birth, and saving the lives of premature babies. Remember how I said that malaria is a top cause of death in Mali and Ethiopia? Well in both those countries, as well as in Bangladesh, pre-term birth is also on that list of top ten causes of death. In fact, according to the WHO, preterm birth is on the rise worldwide. Worldwide, it’s the number one cause of death for children under five. And, just like malaria, in most cases, it is preventable. Antibiotics, vaccines, and insecticide-treated nets are a start. Born on Time conducted an assessment of some of the critical factors in pre-term birth in Bangladesh, Mali and Ethiopia. In Mali, almost eight out of ten women (78.3%) reported that during their last pregnancy they slept under an insecticide-treated nets to protect themselves from malaria. In Ethiopia, just over half (53.7) said the same. It’s a start, but to really protect against the disease, 100% of mothers should be sleeping under insecticide-treated nets. It was likely a mosquito net that kept my mother safe from malaria during her pregnancy. And when I contracted the disease, the malaria medicine that cured me was readily available, and cheap. Born on Time is focusing on ensuring that basic supplies like anti-malarial medications, iron and folate supplements, and vaccines are readily available to pregnant moms at their local health facilities. Our partners are also working with the Ministry of Health to train community health workers in providing quality services. By ensuring mothers are getting the best possible care in Bangladesh, Ethiopia and Mali, Born on Time is fighting back against the infections that cause pre-term term birth.